Hickson 44 is a group of galaxies comprised of NGC 3190 (large spiral galaxy in the center - aka Arp 316b), NGC 3187 (aka Arp 316a) - S-shaped barred spiral galaxy to the lower right of NGC 3190), NGC 3193 (elliptical galaxy above and right of NGC 3190), and NGC 3185 (barred spiral galaxy in lower left of frame). 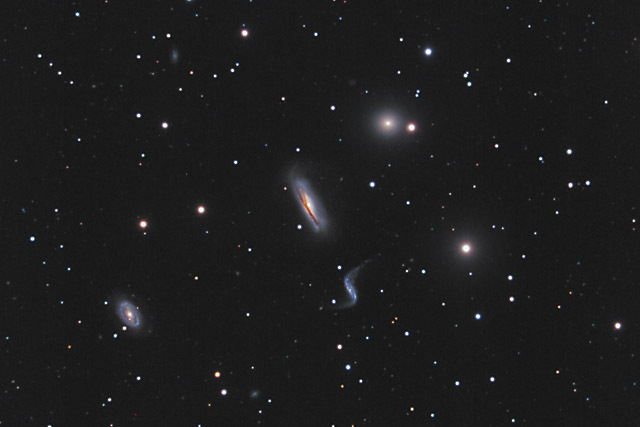 Along with 2 dwarf galaxies, the 4 galaxies form a "compact galaxy group" - a group of galaxies which are close in space and gravitationally interacting. Close inspection of the frame will also reveal a multitude of small background galaxies. In this image, North is to the right. This image is cropped to 56% of the original full frame. Software Used Images Plus 4.5 for camera control, calibration, stacking, digital development, Lucy-Richardson deconvolution, smoothing and noise reduction. Photoshop CS5 used for levels and curves, color balance, high pass filter, star shrinking, saturation adjustments, sharpening and noise reduction. Gradient Xterminator for gradient removal. Carboni Tools for additional saturation adjustments, noise reduction, and smoothing. Notes I used a completely new processing technique with this image in an attempt to pull out the fine detail. I'm very pleased with the final results, as my new technique brought out fine features that I've never had in an image before. In particular, the red dust lane in NGC 3190 has a good amount of detail, and NGC 3185 and NGC 3187 enjoy good resolution as well. This image was published by Astronomy Magazine as its Picture of the Day for March 29, 2012. Its the first image I've had published since I've started doing digital astrophotography!